The Clean Air Act is a federal law enacted by the United States Congress to control air pollution on a national level from both stationary sources (such as coal fired power plants) and mobile sources (such as automobiles and trucks). It requires the Environmental Protection Agency (EPA) to develop and enforce regulations to protect the general public from exposure to airborne contaminants that are known to be hazardous to human health. Public health concerns about clean air have been known for centuries, , and in the 19th and early 20th centuries, efforts to clean up air pollution took place on the municipal or state levels. In the 1940s and 50s, major smog incidents in Los Angeles, CA, and Donora, PA, raised public awareness and concern. The first U.S. federal program to investigate the issue was the Air Pollution Control Act of 1955. The first legislation to enable control of air pollution was the Clean Air Act of 1963, Title 42 U.S.C. § 7401. Major additions and changes were embodied in the Clean Air Act Amendments of 1967, the Clean Air Act (1970), the Clean Air Act Amendments of 1977, and the Clean Air Act (1990). Numerous state and local governments have enacted similar legislation, either implementing federal programs or filling in locally important gaps in federal programs. The Clean Air Act was also significant in that it was the first major environmental law in the United States to include a provision for citizen suits. 1955 Air Pollution Control Act -- First federal clean air law, funded research. 1998 EPA orders 22 states in the Northeast and the Midwest to curb nitrogen oxide emissions, mostly from coal fired power plants in the Ohio Valley region. The new EPA plan called for a 28% regionwide reduction by the year 2007, costing $1.7 billion annually but offset by $3.4 billion annual savings in health benefits, EPA said. 1998 - 2000 Duke Energy makes 29 modifications and upgrades to equipment in older coal-generated power plants without applying for permits from the EPA. The lawsuit Environmental Defense v. Duke Energy Corp. results. 2000, December 20 -- EPA announces decision to include coal- and oil-fired power plants among HAPS sources subject to regulation. 2001 US Supreme Court unanimously affirms EPA authority to regulate air pollution under the Clean Air Act in Whitman v. American Trucking Associations, Inc.  A major issue was the question of whether EPA was required to take costs as well as public health into account; the court said public health could be the main goal of the regulations. 2002 Under pressure from utilities, the new Bush Administration attempts to reverse EPA's New Source Review regulations from the 1977 Clean Air Act. New Source Review required electric utilities to install the best available pollution control technology if they renovated aging coal fired power plants. facilities. The ruling would have exempted half of air pollution sources from the Clean Air Act, and was challenged in court by 14 states. 2005, March 29 -- EPA reverses HAPS determination (of 2000) and decides to “delist” oil and coal power plants from HAPS regulation. 2005, May 18 -- EPA issues a final rule on mercury emissions, which would make it the only one of the HAPs to be regulated. This was the Clean Air Mercury Rule (CAMR) which set mercury standards for new coal-fired power plants and established a national mercury cap and trade program for electric utilities. The idea behind the CAMR was to reduce mercury emissions from coal power plants by 70 percent by 2018. 2006 Attempt to reverse New Source Review is overturned as "contrary to the plain language" of the Clean Air Act by the U.S. Court of Appeals for the District of Columbia. 2007 US Supreme Court also rules that the EPA has the power to regulate carbon dioxide emissions as a pollutant under the Clean Air Act in Commonwealth of Massachusetts v. EPA case. 2007 EPA's Clean Air Scientific Advisory Committee recommends lowering the ground level ozone standard from 85 PPB to between 60 PPB - 70 PPB. The committee concluded that at 75 PPB there would b e 1,300-3,500 fewer premature deaths annually, but recommended lowering the standard to 65 PPB to reduce the number of deaths by 3,000-9,200 each year. The standard was reduced only to 75 PPB in 2008. 2008 -- CAMR appealed, along with the 2005 HAPs delisting. The U.S. Court of Appeals remanded the CAMR based on EPA’s failure to properly delist coal plants from HAPS regulation. 2009, December -- U.S. District Court for the District of Columbia Circuit orders EPA to finally create rules requiring coal- and oil-fired power plants to install pollution controls that meet a maximum achievable control technology (MACT) standard for emissions of mercury and other hazardous air pollutants (HAPs). 2009, April 17 -- EPA rules that man-made emissions of six greenhouse gases, including carbon dioxide, are a danger to the welfare and health of the public, and should therefore be regulated as pollutants. Detailed proposals for the regulation were issued in September, 2009. 2011, March 16 -- Proposes rules on HAPs such as mercury, arsenic, lead, nickel, chromium and hydrochloric acid. 2011, July 11 -- EPA issues final regulations for Cross-State Air Pollution Rule (CSAPR) issued, requiring requires 27 states to reduce power plant emissions that contribute to ozone and/or fine particle pollution in other states. Electric utility reaction in June and July is highly negative. The first Clean Air Act was passed in 1963. It was amended first by the Clean Air Act Amendment in 1966, then by the Clean Air Act Extension of 1970 (84 Stat. 1676, Public Law 91-604). The 1970 extension is sometimes called the "Muskie Act" because of the central role Maine Senator Edmund Muskie played in drafting the content of the bill. The Clean Air Act Amendments in 1977 further modified the law. Congress established the New Source Review (NSR) permitting program as part of the 1977 Clean Air Act Amendments. The NSR process requires industry to undergo an EPA pre-construction review for environmental controls if they proposed either building new facilities or any modifications to existing facilities that would create a “significant increase” of a regulated pollutant. The legislation allowed “routine scheduled maintenance” to not be covered in the NSR process. The next major revision came with the 1990 Clean Air Act, which was enacted by the 101st United States Congress (Pub.L. 101-549). The Clean Air Act Amendments of 1990 proposed emissions trading, added provisions for addressing acid rain, ozone depletion and toxic air pollution, and established a national permits program. The amendments once approved also established new auto gasoline reformulation requirements, set Reid Vapor Pressure (RVP) standards to control evaporative emissions from gasoline, and mandated that the new gasoline formulations be sold from May to September in many states. In 1997, EPA Administrator Carol Browner of the Clinton Administration began tightening the Clean Air Act's National Ambient Air Quality Standards regarding permissible levels of the ground-level ozone that makes up smog and the fine airborne particulate matter that makes up soot. The decision came after months of public review of the proposed new standards, as well as long and fierce internal discussion within the Clinton administration, leading to the most divisive environmental debate of that decade. The new regulations were challenged in the courts by industry groups as a violation of the U.S. Constitution's nondelegation principle and eventually landed in the U.S. Supreme Court, whose 2001 unanimous ruling in Whitman v. American Trucking Associations, Inc. largely upheld Browner's and the EPA's actions. A second landmark Supreme Court case involving the Clean Air Act was Massachusetts v. EPA, 2007, in which the court agreed with Massachusetts and 11 other states that the EPA should regulate greenhouse gases. The often confusing role of the EPA in enforcing the Clean Air Act should be seen in light of the shifting balance of Democratic and Republican party control of the White House and the executive branch of government. EPA was generally in favor of strong regulation during the Carter (1977 - 1981), Clinton (1993- 2001) and Obama (2009 - present) administrations, but tended to oppose environmental regulation in the Reagan and George H. Bush administrations (1981 - 1993) and the George W. Bush administration (2001- 2009). The Clean Air Act, Clean Water Act and other programs are federal, but states run more than 95 percent of EPA’s programs and 90 percent of the enforcement actions under State Implementation Plans (SIP). In exchange, the EPA funds many of the programs. However, electing a SIP is not mandatory and in some cases states have chosen to not accept responsibility for enforcement of the act and force the EPA to assume those duties. In order to take over compliance with the CAA the states must write and submit an SIP to the EPA for approval. A state implementation plan is a collection of the regulations a state will use to clean up polluted areas. The states are obligated to notify the public of these plans, through hearings that offer opportunities to comment, in the development of each state implementation plan. The SIP becomes the state's legal guide for local enforcement of the CAA. For example, in the case of Rhode Island, the Rhode Island General Law Title 23 Chapter 23 Section 2 (RIGL 23-23-2) states that it is a state policy requirement to comply with the Federal CAA (42 U.S.C. § 7401) through the SIP. The state SIP delegates permitting and enforcement responsibility to the state Department of Environmental Management (RI-DEM). The law recognizes that states should lead in carrying out the Clean Air Act, because pollution control problems often require special understanding of local industries, geography, housing patterns, etc. However, states are not allowed to have weaker pollution controls than the minimum criteria set for the whole country by the EPA. EPA must approve each SIP, and if a SIP isn't acceptable, EPA can take over, enforcing the Clean Air Act in that state. The Clean Air Act, which was last amended in 1990, requires EPA to set National Ambient Air Quality Standards (40 CFR part 50) for pollutants considered harmful to public health and the environment. The Clean Air Act established two types of national air quality standards. Primary standards set limits to protect public health, including the health of "sensitive" populations such as asthmatics, children, and the elderly. Secondary standards set limits to protect public welfare, including protection against decreased visibility, damage to animals, crops, vegetation, and buildings. The EPA is required to set and review the standards every five years, and must base their analysis and policy changes on the most current scientific studies. Also see Clean Air Act Part A on Air Quality and Emission Standards and particularly the section on National ambient air quality standards. In November 2009, the EPA proposed new National Ambient Air Quality Standards for sulfur dioxide, the first time since 1971 that the agency has recommended tightening controls on SO2 to protect public health. The old limits measured sulfur dioxide averages over 24-hour and one-year periods. The new rule would require one-hour measurements, such that a spike of emissions above a new limit — between 50 and 100 parts per billion in one hour — would no longer be acceptable. The new standard was issued on June 3, 2010. The Ozone National Ambient Air Quality Standards (NAAQS) refers to proposed EPA regulations on ground-level ozone, a primary ingredient in smog linked to respiratory illnesses. In January 2010, EPA Administrator Lisa Jackson said tightening the nation's air-quality standard for ozone was "long overdue," and would save an estimated 12,000 lives a year and yield health benefits up to $100 billion annually in 2020. The EPA proposed setting the standard at between 60 and 70 parts per billion, down from the current 75 ppb, by the end of 2010. The EPA's proposal has the support of the American Lung Association and the American Medical Association, and is consistent with the recommendation of a 23-member panel of clean-air experts who advised the agency on the issue after reviewing more than 1,700 studies. In December 2010, the EPA said that it will not decide until July 2011 whether to tighten the national air-quality standard for ozone. In a Dec. 8 written statement, the EPA said it would ask the panel of clean-air experts for "further interpretation" of the studies they relied upon in making their recommendation, so as to ensure the agency's final decision "is grounded in the best science." In a written statement after the EPA delay, the American Lung Associations said it was "exploring legal options" aimed at requiring the EPA to make a decision on the issue. Based on EPA's own estimates, the group added, a six-month delay means an estimated 2,000 to 6,000 people "will lose their lives because they must breathe air pollution that would have been cleaned up if the EPA had met its most recent deadline of December 31, 2010." A 2009 court ruling concluded that the EPA standards for the amount of soot permissible in the air on an annual average ignored the advice of scientific advisers by maintaining the standard established in 1997 and must be rewritten. That limit was 15 micrograms per cubic meter of air. In December 2012 the EPA issued its final NAAQS PM rules, tightening the federal soot standards by 20 percent - the most protective measure laid out in its June 2012 draft rule (12 micrograms per cubic meter of air). The agency will determine which areas are out of attainment in 2014, and the communities will then have six years to comply. The EPA estimates that 66 of the nation’s 3,033 counties will be found in violation of the new standard. It projects seven — all in California — will still be out of compliance by 2020. The Acid Rain program, created under Title IV of the Act in 1990, was enacted to address the problem of acid rain by curbing sulfur dioxide and nitrogen oxide emissions. The acid rain controls were implemented in two phases and placed a decreasing cap on emissions over several years. Included in the 1990 amendments was a controversial provision allowing companies to buy, sell and trade pollution credits, provided they cut half of their overall emissions. In 2005 the U.S. EPA approved the Clean Air Interstate Rule, requiring a 57 percent cut in sulfur dioxide emissions and a 61 percent cut in nitrogen oxide emissions from power plants by 2015. In November 2009, the EPA proposed new limits on sulfur dioxide (see NAAQS above). On December 20, 2000, the EPA determined pursuant to CAA section 112(n)(1)(A) that it was appropriate and necessary to regulate coal- and oil-fired electric generating units (EGUs) under CAA section 112 and added such units to the CAA section 112(c) list of sources that must be regulated under CAA section 112(d). (December 2000 Finding; 65 FR 79,825.) Section 112 of the Clean Air Act requires national emission standards for Hazardous Air Pollutants (HAPs). The emission standards must reflect application of the maximum-achievable control technology (MACT). On March 29, 2005, EPA issued a final rule, in which it found that it was neither appropriate nor necessary to regulate coal- and oil-fired EGUs under section 112, and it removed such units from the CAA section 112(c) list of sources (“2005 Action”). Instead, on March 15, 2005, the EPA issued the Clean Air Mercury Rule (CAMR) to cap and reduce mercury emissions from coal-fired power plants for the first time ever. On February 8, 2008, the DC Circuit struck down CAMR in New Jersey v. EPA, No. 05-1097 (D.C. Cir. Feb. 8, 2008), as the Act removed oil and coal-fired electric utility steam generating units (EGUs) from the list of sources of hazardous air pollutants and instead regulated the emissions through a cap-and-trade program. New Jersey, and several other states, municipal governments, and environmental groups, challenged CAMR claiming that EPA had no authority to delist the EGUs without providing a “specific finding” under section 112(c)(9) of the Clean Air Act. The DC Circuit agreed with the Petitioners, vacating both the delisting rule and CAMR. After the ruling, the EPA began developing air toxics emissions standards for power plants under the Clean Air Act (Section 112), consistent with the D.C. Circuit’s opinion. On March 16, 2011, EPA announced its proposed emissions standards to limit mercury, acid gases and other toxic pollution from power plants, to prevent an estimated 91 percent of the mercury in coal from being released to the air. The proposed rule covered national emission standards for hazardous air pollutants (NESHAP) from coal- and oil-fired electric utility steam generating units (EGUs) under Clean Air Act section 112(d), and proposed revised new source performance standards (NSPS) for fossil fuel-fired EGUs under CAA section 111(b).The EPA estimated that there are approximately 1,350 units affected by the action, including 1,200 existing coal-fired units. In December 2011, the Obama administration announced the new rule to limit emissions of mercury, arsenic and other toxic substances from sources such as power plants. Under the new rule, power plants can emit 1.2 pounds of mercury per million BTUs of energy produced. Industry had sought a limit of 1.4 pounds, but the EPA arrived at its figure based on a formula set out under the Clean Air Act, and analysts said the agency could not deviate from it. Companies would have three years to clean up their emissions of mercury and about 70 other toxic substances, and utilities could appeal for at least one more year as they install the necessary equipment. A parallel issue with regard to HAPs regulation through maximum-achievable control technology (MACT) involves specific industry groups, such as industrial, institutional, and commercial boilers. On Feb. 26, 2004, National Emission Standard for Hazardous Air Pollutants (NESHAP), commonly referred to as the Industrial Boiler MACT Rule, was finalized by the EPA. However, on June 8, 2007, the U.S. Court of Appeals for the District of Columbia Circuit issued a decision to vacate the Industrial Boiler MACT Rule, and the EPA was required to rewrite it. In a motion filed on December 7, 2010, the EPA asked for an extension in a court-ordered schedule for issuing rules that would reduce harmful air emissions from large and small boilers and solid waste incinerators, which would cut emissions of pollutants, including mercury and soot. EPA was under court order to issue final rules on January 16, 2011 and was seeking in its motion to the court to extend the schedule to finalize the rules by April 2012. The agency said the additional time is needed "to re-propose the rules based on a full assessment of information received since the rules were proposed." On May 16, 2011, the L.A. Times reported that the Obama administration had decided to delay the toxins rule on boilers indefinitely, although EPA Administrator Lisa Jackson has said the proposed rule for coal- and oil-fired electric generating units remains. The EPA estimates that there are more than 13,500 boilers and process heaters that will be subject to the Industrial Boiler Rule. The rule is expected to have the most significant impact on facilities that utilize coal- or biomass-burning boilers (solid-fuel-fired boilers), which would have to reduce emissions of mercury as well as particulate matter, carbon monoxide, and dioxin. The EPA estimates there are approximately 600 coal-fired boilers and 400 biomass-fired boilers that will be affected by the rule. On Oct. 12, 2011, the House of Representatives voted to delay the industrial boiler MACT rules in a 275 - 142 vote. Republicans, who prevailed in the vote, argued that the boiler MACT rules would cost the economy billions of dollars. Democrats, especially Jim Moran (VA) and Edward Markey (Mass) argued that repealing the rule would result in thousands of needless deaths. "If the regulation to remove mercury, lead and cancer-causing toxins from incinerators and industrial boilers, which is already 11 years overdue, is delayed for even one year, there will be 6,600 people who will die prematurely, and people will miss 320,000 days of work and school," said Markey. On December 2, 2011, under pressure from Republicans and industrial groups, the EPA proposed rules on boilers that are more flexible than ones the agency introduced in 2010. EPA's revised changes for boilers include additional subcategories, new emission limits and increased flexibility in compliance monitoring for meeting particle pollution and carbon monoxide limits. The agency also revised emission limits on incinerators, including those for dioxin and mercury. Under the new rule, more than 99 percent of the country's boilers, from heavy industry to small businesses and universities, are either clean enough and not subject to the new rules, or will only need to do tune ups and maintenance to comply. The rules allow some plants to do maintenance on equipment, avoiding costs from adding new controls or replacing boilers. The EPA said it would finalize the reconsideration in spring 2012. However, on January 9, 2012, the DC Circuit Court of Appeals issued a ruling reinstating the original compliance deadlines, which require owners and operators of boilers and incinerators to install maximum achievable control technology to meet the best practice standards by March 21, 2012. Air pollution often travels from its source in one state to another state. In many metropolitan areas, people live in one state and work or shop in another; air pollution from cars and trucks may spread throughout the interstate area. The 1990 Clean Air Act provides for interstate commissions on air pollution control, which are to develop regional strategies for cleaning up air pollution. The 1990 Clean Air Act includes other provisions to reduce interstate air pollution. In 2010, the EPA announced new air pollution standards for power plants in 31 states and the District of Columbia, know as the Transport Rule. The rules aim to limit pollution that drifts from upwind states into neighboring downwind states. Ohio coal plants, for example, are a cause of air pollution in Maryland. Acting under federal court order, the Obama administration proposed the new air-quality rules on July 6, 2010, for coal-burning power plants. The pollutants being singled out in the new rule making — sulfur dioxide and nitrogen oxides — react in the atmosphere to form fine particulates and ground-level ozone (smog). They are easily carried by the wind and affect states and cities far downwind from the plants where they are produced. The proposed regulation would apply to power plants in 31 states east of the Rockies, with the exception of the Dakotas, Vermont, New Hampshire and Maine, replacing the EPA's 2005 Clean Air Interstate Rule (CAIR) and cutting sulfur-dioxide emissions by an additional 1 million tons and nitrogen-oxide emissions by 100,000 tons, as well as limiting inter-state trading of pollution allowances. CAIR, passed under George W. Bush, would have allowed emissions sources in different states to trade with each other, but a D.C. Circuit Court (in North Carolina v. EPA, 531 F.3d 896) found the provision was not harmonious with the Clean Air Act, as the EPA should know the outcome of its rules in advance, at least at the state level. The transport rule responded to the ruling by largely eliminating interstate trading, although intra-state trading is still allowed. Gina McCarthy, head of the E.P.A.’s air and radiation office, said the new rules would reduce emissions of sulfur dioxide and nitrogen oxides by hundreds of thousands of tons a year and bring $120 billion in annual health benefits. Those benefits, Ms. McCarthy said, include preventing 14,000 to 36,000 premature deaths, 23,000 nonfatal heart attacks, 21,000 cases of acute bronchitis, 240,000 cases of aggravated asthma and 1.9 million missed school and work days. Additionally, the rule would substantially reduce unhealthy smog. The cost of compliance to utilities and other operators of power plants would be $2.8 billion a year, according to E.P.A. estimates. The proposed regulation will require utilities operating coal-burning plants to install scrubbers and other technology to reduce emissions of the pollutants. Some companies may decide to retire older plants rather than invest in new control measures because other new rules under the Clean Air Act are expected in the coming years. The new rules do not address power plant emissions of carbon dioxide and five other pollutants that contribute to global warming. A 2010 report suggests the EPA is underestimating the net savings from SO2 and NOx regulations because it focuses almost exclusively on direct health costs, which does not capture the full impact of the pollution on the economy, such as "higher labor and health insurance costs, lost jobs, lost state and local tax revenue, and higher gasoline prices." The report, "Expensive Neighbors: The Hidden Cost of Harmful Pollution to Downwind Employers and Businesses" by electricity industry expert Dr. Charles J. Cicchetti finds that power plants without SO2 and NOx scrubbers are imposing an estimated $6 billion in annual costs on downwind businesses. When these costs are added to health costs to individuals, the benefits of the EPA's upcoming Clean Air Transport Rule, which would put tighter limits on ozone pollution, "exceed compliance costs by about 100 times." Cicchetti concludes: "There are people who will argue that the benefits of a greener environment are fine when the country is at full employment. But when the country is suffering unemployment, when states are having trouble balancing budgets and businesses are having trouble keeping employees, we can't afford the investments and efforts to make the air cleaner. By drilling down to the employment and businesses effects, showing that those benefits outweigh the additional costs, I've tried to show that we should do it sooner rather than later, that it will reduce the costs of employment in affected areas and stimulate jobs. Now is a better time to get on with the task of making the air better and healthier." In April 2007, the US Supreme Court extended the Clean Air Act to included global warming pollution. The court said in Massachusetts v. EPA, 549 U.S. 497 (2007) that the EPA violated the Clean Air act by not regulating greenhouse gas emissions, the major contributor to climate change. In May 2007, President George W. Bush issued an executive order, the Clear Skies Initiative, proposing regulations on greenhouse gases weaker than those proposed by the EPA itself following the court order. The American Clean Energy and Security Act in the form that it passed the US House of Representatives would strip the authority from EPA under the Clean Air Act to regulate green house gasses. On April 17, 2009 the EPA issued a “proposed endangerment finding” and a related proposed “cause or contribute finding” regarding greenhouse gases under section 202(a) of the Clean Air Act (section dealing with “Emission standards for new motor vehicles or new motor vehicle engines”). The EPA held a 60-day public comment period for these proposed findings, and received over 380,000 public comments. On December 7, 2009, the EPA issued two final findings regarding greenhouse gases under section 202(a) of the Clean Air Act: Endangerment Finding – The Administrator finds that the current and projected concentrations of the six key well-mixed greenhouse gases--carbon dioxide (CO2), methane (CH4), nitrous oxide (N2O), hydrofluorocarbons (HFCs), perfluorocarbons (PFCs), and sulfur hexafluoride (SF6)--in the atmosphere threaten the public health and welfare of current and future generations. Cause or Contribute Finding – The Administrator finds that the combined emissions of these well-mixed greenhouse gases from new motor vehicles and new motor vehicle engines contribute to the greenhouse gas pollution which threatens public health and welfare. On March 3, 2010 EPA Administrator Lisa Jackson told the Senate Appropriations panel reviewing EPA's budget that the agency would focus on large polluters spewing more than 75,000 tons a year. “It will probably be at least two years before we would look at something like, say, a 50,000 threshold,” Jackson said. The initial phase of greenhouse-gas rules will go into effect in 2011 said Jackson. Senator John D. Rockefeller IV (D) of West Virginia on March 4, 2010 introduced legislation that would delay the EPA's carbon rules. The bill calls for a "two-year suspension" that will give Congress “the time it needs to address an issue as complicated and expansive as our energy future." Two House Democrats, West Virginia’s Nick Rahall and Virginia’s Rick Boucher, also introduced legislation that would put EPA's greenhouse gas regulations for so-called “stationary sources” on hold for two years. Rep. Rahall was co-author of the cap-and-trade bill that passed the House in June 2009 and would replace EPA direct regulation on carbon emissions. On February 9, 2011, EPA Administrator Lisa Jackson made a trip to Capitol Hill to speak before the Energy and Power Subcommittee of the House Energy and Commerce Committee. Lisa Jackson came under fire from House Republicans who charged that the EPA's proposed emissions rules would mean "higher prices and fewer jobs." Lisa Jackson stated that a bill drafted by Rep. Fred Upton, R-Mich., to prevent the EPA from using the act to curb greenhouse gases, was "part of a broader effort in this Congress to delay, weaken, or eliminate Clean Air Act protections of the American public." It was the first time Jackson had visited Congress since the Republicans took control. On March 3, 2011, Senator James Inhofe, Republican of Oklahoma, and Representative Fred Upton, Republican of Michigan, formally introduced the “Energy Tax Prevention Act,” a bill that they said would reverse the EPA’s finding that carbon dioxide and other heat-trapping greenhouse gases are a danger to human health and the environment. According to Inhofe: “The Energy Tax Prevention Act stops cap-and-trade regulations from taking effect once and for all." The bill has 42 co-sponsors in the Senate, all Republicans. In the House, three Democrats joined Upton and his Republican co-sponsors - Nick Rahall of West Virginia, Dan Boren of Oklahoma and Collin Peterson of Minnesota, reportedly to protect key industries in their states – coal, oil and agriculture – that would be affected by greenhouse gas regulations. The Inhofe-Upton bill allows many Clean Air Act programs to continue, but takes away the agency’s authority to apply the landmark law to carbon dioxide. A deal negotiated with automakers to limit carbon dioxide emissions from cars and light trucks would be allowed to stand through 2016, but no further greenhouse gas emissions rules for vehicles would be permitted. State programs to try to address global warming and carbon emissions would be allowed to continue. On March 14, 2013 Congressman Matt Cartwright (PA) and Congressman Jared Polis (CO) introduced two bills in the U.S. House of Representatives to close loopholes in the Clean Air Act and Clean Water Act for fracking operations. he two bills introduced today—titled the “Bringing Reductions to Energy’s Airborne Toxic Health Effects”, or BREATHE Act, and the “Focused Reduction of Effluence and Stormwater runoff through Hydrofracking Environmental Regulation,” or FRESHER Act. Specifically, the BREATHE Act, introduced by the two Congressmen and at least 32 co-sponsors, would close a loophole in the Clean Air Act that currently allows the oil and gas industry to release large amounts of pollution into the air, and lists hydrogen sulfide as a hazardous air pollutant. The FRESHER Act, introduced by Congressmen Cartwright and Polis and at least 37 co-sponsors, would close a loophole in the Clean Water Act that exempts the oil and gas industry from permitting requirements for industrial stormwater runoff. On March 16, 2011, the U.S. Environmental Protection Agency (EPA) announced its proposed emissions standards to limit mercury, acid gases and other toxic pollution from power plants. The EPA estimates that there are approximately 1,350 units affected by the action, including 1,200 existing coal-fired units. A 2011 report by Ceres, "New Jobs - Cleaner Air" found that updated EPA rules on air pollution could create nearly 1.5 million jobs over the next five years. Engineering, construction and pipefitting are some of the professions that could see a rise in jobs through investments to comply with the Clean Air Act. Ceres is a coalition of environmentalists and institutional investors, and the report was produced by researchers at University of Massachusetts Political Economy Research Institute. It quoted the Office of Management and Budget, which said in 2003 that every dollar spent on compliance with the act since 1970 has led to $4 to $8 in economic benefits. In addition, the clean air rules can create jobs not counted in the report, such as in exports of domestically produced technologies like scrubbers that capture pollutants before they reach smokestacks. The report looked at EPA rules designed to reduce emissions in the eastern half of the country of smog-causing chemicals, known as the Transport Rule, and to cut output of mercury and other hazardous pollutants from boilers, known as the Utility Maximum Achievable Control Technology (MACT) rule. According to an EPA report released in March 2011, "The Benefits and Costs of the Clean Air Act from 1990 to 2020", the annual dollar value of benefits of air quality improvements from 1990 to 2020 will reach a level of approximately $2.0 trillion in 2020. The benefits would be achieved as a result of Clean Air Act Amendment-related programs and regulatory compliance actions, estimated to cost approximately $65 billion by 2020. Most of the benefits (about 85 percent) are attributable to reductions in premature mortality associated with reductions in ambient particulate matter: "as a result, we estimate that cleaner air will, by 2020, prevent 230,000 cases of premature mortality in that year" (Introduction). The remaining benefits are roughly equally divided among three categories of human health and environmental improvement: preventing premature mortality associated with ozone exposure; preventing morbidity, including acute myocardial infarctions and chronic bronchitis; and improving the quality of ecological resources and other aspects of the environment. According to the report: "The very wide margin between estimated benefits and costs, and the results of our uncertainty analysis, suggest that it is extremely unlikely that the monetized benefits of the CAAA over the 1990 to 2020 period reasonably could be less than its costs, under any alternative set of assumptions we can conceive. Our central benefits estimate exceeds costs by a factor of more than 30 to one, and the high benefits estimate exceeds costs by 90 times. Even the low benefits estimate exceeds costs by about three to one." Harvard Professor Dale W. Jorgenson, a dean of macroeconomic modeling, calculated that gross domestic product in 2010 was 1.5 percent higher because of the Clean Air Act of 1970, due to savings in health and environmental costs. Following Republican election victories in November, 2010, and the seating of a Republican-controlled House of Representatives in January, 2011, the Clean Air Act has come under heavy fire. Although most of the Republican votes are unlikely to pass the Democratic Senate, or a presidential veto, final implementation of key portions of the 20-year-old Clean Air Act has stalled. Oct 12, 2011 -- EPA Regulatory Relief Act (H.R. 2250) -- delays EPA's MACT boiler rules. A lawsuit by 25 states against the MACT rule filed in October, 2011. Clean Air Act, Environmental Protection Agency, as amended in 1990. Clean Air Act and National Ambient Air Quality Standards in the Wikipedia. David M. Lindahl, "The Webster-Heise Valve. A Significant Improvement in the Internal Combustion Engine and its Fuels?" Congressional Research Service (Report 820176), 1982. "Our Children At Risk. The 5 Worst Environmental Threats To Their Health," Natural Resources Defense Council, 1997. "Clean Air Act Issues in the 107th Congress," Congressional Research Service, Updated June 3, 2002, by James E. McCarthy, Resources, Science, and Industry Division, Library of Congress. Final Report: "Ambient Air Quality Trends. An Analysis of Data Collected by the U.S. Environmental Protection Agency," Prepared for the Foundation for Clean Air Progress by Meszler Engineering Services, Abingdon, MD, September 1, 2004. Program Assessment:"National Ambient Air Quality Standards Research" and "National Ambient Air Quality Standards and Regional Haze Programs", WhiteHouse.gov, 2005. "National Ambient Air Quality Standards", Sierra Club, revised October 2006. "Statement by the President" [about lead], Office of the White House Press Secretary, April 17, 2001. Table of Contents: Clean Air Act, Environmental Protection Agency (EPA). "This page lists the sections of the Clean Air Act as amended in 1990. Click on a specific title to see a list of that title's sections. Click on a specific section to see the text of that section." "The Plain English Guide to the Clean Air Act" (EPA-400-K-93-001 April 1993) posted on EPA website. Proposed Rule: "Ambient Air Quality Surveillance for Lead," Federal Register Online via Government Printing Office's GPO Access, November 5, 1997 (Volume 62, Number 214), Page 59840-59842. "Draft Report on Alkyl-Lead: Sources, Regulations and Options," Binational Toxics Strategy (United States and Canada), 1997. Final Rule: "Ambient Air Quality Surveillance for Lead," Environmental Protection Agency, Federal Register Online via GPO Access, January 20, 1999 (Volume 64, Number 12), Page 3030-3037. "Lessons Learned for the National Children’s Study from the National Institute of Environmental Health Sciences/U.S. Environmental Protection Agency Centers for Children’s Environmental Health and Disease Prevention Research" by Carole A. Kimmel, Gwen W. Collman, Nigel Fields, and Brenda Eskenazi, Environ Health Perspect. 2005 October; 113(10): 1414–1418. CleanAirProgress.org, Foundation for Clean Air Progress website. Pollution Locator: Hazardous Air Pollutants by Scorecard.org. Air Quality Trends, Environmental Technology Centre, Government of Canada. Ambient Air Quality Monitoring Data in Asia and related websites, CleanAirNet.org. Air quality publications: National Environmental Standards documents, Ministry for the Environment, New Zealand. Ambient Air Quality and Ambient Air Quality Monitoring, State of the Environment Tasmania. "Monitoring ambient air quality for health impact assessment," WHO regional publications. European series; No. 85, World Health Organization, 1999. "Proposal for a Directive of the European Parliament and of the Council on ambient air quality and cleaner air for Europe," Commission of the European Communities, 2005. "Ambient Air Quality," European Union/European Commission, Updated June 14, 2006. Nicholas Regush, "Poison Wind. It took 70 years to get the Ethyl Corporation's lead out of our gas tanks. Now, Ethyl's back with a new toxic additive: MMT," Mother Jones (RedFlagsDaily.com), May/June 1992. News Release: "Solid Waste Incineration May Exceed Leaded Gasoline As Source Of Lead Air Pollution In Cities. Central Park Sediment Cores Contradict Current Scientific Thinking," American Chemical Society (Science Daily), January 21, 1999. Jamie Lincoln Kitman, "The Secret History of Lead: Special Report," The Nation, March 2, 2000 (March 20, 2000, issue). Thomas O. McGarity, "The Goals of Environmental Legislation," Boston College Law Review, March 2002. Traci Watson, "EPA to offer plan for reducing mercury emissions," USA TODAY, December 2, 2003. Allison Dunfield, "Canada not helping to clear the air," The Globe and Mail (Canada), May 24, 2005. Tim Dickinson, "A Polluter's Feast. Bush has reversed more environmental progress in the past eight months than Reagan did in a full eight years," Rolling Stone, September 8, 2005. "EPA Is Using Katrina to Undermine the Clean Air Act," Committee on Government Reform Minority Office, September 22, 2005. Frank O'Donnell, "Stalled At The Pump," Tom Paine.Common Sense, September 22, 2005. "Clean Air Watch Warns House Energy Bill Is Biggest Clean Air Act Weakening in History," US Newswire, September 29, 2005. John Dale Dunn, "EPA Makes Mistakes in Proposed Air Quality Standards," Environment News (Heartland Institute), December 1, 2006. Juliet Eilperin, "EPA proposes new rules for reporting release of toxic chemicals after protest," Washington Post (The Star-Ledger (NJ)), December 1, 2006. Timothy Gardner, "U.S. mulls removing lead from list of pollutants," Reuters, December 6, 2006. John Heilprin, "EPA May Drop Lead Air Pollution Limits," Associated Press (Washington Post), December 6, 2006. "Bush Trying To Dump Lead Air Pollution Limits," AlaskaReport.com, December 6, 2006. Mike Buetow, "EPA Evaluating Nation's Lead Use," Circuits Assembly (Journal), December 7, 2006. William J. Cromie, "Dust from Asia invades North America. African dust also reaches both coasts," Harvard University Gazette, December 7, 2006. John Aravosis, "Bush was against our children breathing lead before he was for it," AMERICAblog, December 7, 2006. Paul Kiel, "EPA: Don't Get the Lead out," TPM Muckraker, December 7, 2006. Chris Baltimore, "Court strikes down 2004 EPA smog rules," Reuters (ABC News), December 22, 2006. Steve Lawrence, "EPA helps state pave path for auto emissions cuts. Agency OKs state rules allowing manufacturing of hydrogen fuel cell cars," Associated Press (Contra Costa Times), December 23, 2006. ↑ Peter Brimblecombe, “The big smoke: A history of air pollution in London since Medieval times” Routledge, 2011. ↑ [ http://www.epa.gov/air/caa/caa_history.html “History of the Clean Air Act”] EPA, accessed August 6, 2011. ↑ "Clean Air Act" EPA, July 5, 2010. 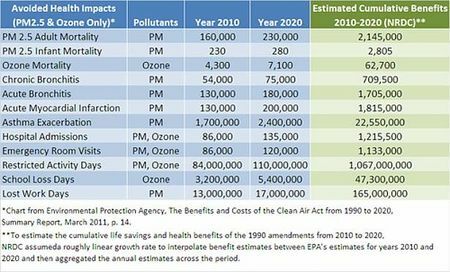 ↑ “Benefits and costs of the Clean Air Act,” US EPA, April, 2011. ↑ 5.0 5.1 5.2 5.3 "NSR" EPA, accessed July 2010. ↑ 6.0 6.1 6.2 6.3 "Overview - The Clean Air Act Amendments of 1990" EPA, accessed July 2010. ↑ Cushman Jr., John H. "Clinton Sharply Tightens Air Pollution Regulations Despite Concern Over Costs," New York Times. June 26, 1997). ↑ Linda Greenhouse "E.P.A. 's Right to Set Air Rules Wins Supreme Court Backing". New York Times, Feb. 28, 2001. ↑ Cross State Air Pollution Rule” EPA, July 11, 2011. ↑ "25 states urge court to make EPA delay power plant rule" Reuters, Oct. 10, 2011. ↑ Linda Greenhouse, "E.P.A. 's Right to Set Air Rules Wins Supreme Court Backing" The New York Times, February 28, 2001. ↑ 12.0 12.1 12.2 12.3 "§ 7410. State implementation plans for national primary and secondary ambient air quality standards" Cornell Law University, accessed July 2010. ↑ Gabriel Nelson “State regulators list 33 ways EPA rules aren’t working,” New York Times, April 21, 2011. ↑ "National Ambient Air Quality Standards (NAAQS)" EPA, accessed July 2010. ↑ Renee Schoof, "EPA proposes sulfur dioxide limits for first time since 1971," McClatchy Newspapers, November 29, 2009. ↑ John Broder, "E.P.A. Tightens Its Sulfur-Dioxide Limits" NY Times, June 3, 2010. ↑ 18.0 18.1 18.2 18.3 Stephen Power, "EPA Again Delays Tighter Ozone Restrictions" The Wall Street Journal, Dec. 9, 2010. ↑ Juliet Eilperin, "EPA tightens soot rules by 20 percent," Washington Post, Dec. 14, 2012. ↑ Richard Wolf, "Obama decides against tougher ozone standards" USA Today, Sept. 2, 2011. ↑ Wendy Koch "Obama, EPA sued for nixing tougher ozone rules" USA Today, Oct. 11, 2011. ↑ The Effects of Title IV of the Clean Air Act Amendments of 1990 on Electric Utilities, Energy Information Administration, March 1997. ↑ “Cap-and-Trade Model Eyed for Cutting Greenhouse Gases”, San Francisco Chronicle, December 3, 2007. ↑ “Utilities amassing landfills: Tougher air standards send tons of plants' sludge, coal ash into ground”, Columbus Dispatch, April 14, 2008. ↑ "§ 7651 "Findings and purposes" Cornell Law University, accessed July 2010. ↑ EPA, "National Emission Standards for Hazardous Air Pollutants from Coal- and Oil-fired Electric Utility Steam Generating Units and Standards of Performance for Fossil-Fuel-Fired Electric Utility, Industrial-Commercial-Institutional, and Small Industrial-Commercial-Institutional Steam Generating Units" Proposed Rule, March 16, 2011. ↑ "Clean Air Mercury Rule" EPA, accessed July 2010. ↑ Chris Holly, "Expect new mercury rules by 2011" Coal Power, Dec. 10, 2009. ↑ 31.0 31.1 "Fact Sheet: Proposed Mercury and Air Toxics Standards" EPA, accessed March 2011. ↑ Gabriel Nelson, "Southern Co. sees price tag of at least $13 billion for new EPA rules" New York Times, Aug. 5, 2011. ↑ Ray Henry "Georgia Power says pollution rules may close plants," Associated Press, Aug. 5, 2011. ↑ Kristi E. Swartz "Ga.Power says it can't meet EPA deadline," Atlanta Journal and Constitution, July 23, 2011. ↑ Neela Banerjee, "EPA issues strong limits on mercury emissions from smokestacks" LA Times, Dec. 21, 2011. ↑ 37.0 37.1 Don Wolf, "Understanding the Industrial Boiler MACT Rule" HPAC Engineering, June 3, 2011. ↑ "EPA Seeks New Timetable for Reducing Pollution from Boilers and Incinerators/Agency committed to developing rules that are protective, cost effective and based on sound science" EPA, Dec. 7, 2010. ↑ Neela Banerjee, "EPA delays rule on industrial emissions" LA Times, May 16, 2011. ↑ "Daily Show: Lisa P. Jackson" Daily Show, May 19, 2011. ↑ Josiah Ryan "House votes to delay EPA ‘boiler’ regulations" The Hill, Oct. 13, 2011. ↑ 42.0 42.1 42.2 "Appeals Court Reinstates EPA's Boiler Clean Air Rule" ENS Newswire, Jan. 10, 2012. ↑ Timothy Gardner, "EPA proposes less costly pollution rule on boilers" Reuters, Dec. 3, 2011. ↑ Tennille Tracy, "Wave Of EPA Regulations Could Overshadow New Pollution Rule" NASDAG, July 9, 2010. ↑ Nathan Richardson, "Death of Cap and Trade?" Weathervane, July 7, 2010. ↑ John M. Broder EPA issues tougher rules for power plants New York Times, July 7, 2011. ↑ EPA finalizes expensive new regulation American Coalition for Clean Coal Electricity, press release, July 7, 2011. ↑ CEO statement regarding EPA cross-state rule ERCOT News release, July 19, 2011. ↑ 51.0 51.1 51.2 David Roberts, "New report shows dirty coal doing even more damage than you thought " Grist, Dec. 9, 2010. ↑ Gabriel Nelson "Kan. Sues EPA Over Orders to Cut Interstate Emissions From Power Plants" New York Times, Sept. 20, 2011. ↑ "Ga. AG sues EPA over new air pollution rule" Associated Press, Oct. 6, 2011. ↑ Leslie Brooks Suzukamo,"Xcel suing EPA over air pollution regulations" Minneapolis Pioneer Press, Oct. 7, 2011. ↑ 55.0 55.1 "Leak Detection and Repair: A Best Practices Guide (PDF)" EPA, accessed July 2010. ↑ Robert Barnes and Juliet Eilperin, "High Court Faults EPA Inaction on Emissions" The Washington Post, April 3, 2007. ↑ "Endangerment and Cause or Contribute Findings for Greenhouse Gases under the Clean Air Act" United States Environmental Protection Agency, December 18, 2009. ↑ "Waxman-Markey Strips EPA of Clean Air Act Authority to Fight Global Warming," Friends of the Earth, accessed August 2009. ↑ "EPA’s Carbon Decision Gives Obama Copenhagen Tool," Bloomberg, December 7, 2009. ↑ "EPA Moves to Regulate CO2 as a Hazard to Health," Time, December 7, 2009. ↑ "EPA Waits for 2013 on Carbon Emissions of 50,000 Tons a Year" Kim Chipman, Bloomberg March 3, 2010. ↑ "Rockefeller Introduces Bill to Delay EPA Carbon Rules" Simon Lomax, Bloomberg March 5, 2010. ↑ 69.0 69.1 "Putting EPA’s announcement on CO2 from power plants in context" Grist, Dec. 23, 2010. ↑ "FRESHER and BREATHE Acts Introduced to Close Fracking Loopholes" Water World, March 14, 2013. ↑ "New Clean Air Rules Could Create 1.5 Million Jobs: Report" HuffPo, Feb. 9, 2011. ↑ "Why Republican attacks on environment laws are flawed" Guardian, Nov. 15, 2011. ↑ "G.O.P. vs. the Environment" Editorial, New York Times, Oct. 14, 2011. This page was last edited on 19 March 2013, at 18:57.